Locality: United States, Colorado, Clear Creek, 0.2 mi. west of Dumont. Habitat: On eroded hillside. 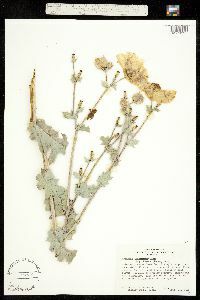 A single large plant. Occurrence Remarks: Plant about 4 ft tall, with 4 main stems. In full flower; capsules apparently abortive, indicating self-sterility. This observation borne out by controlled pollinations of this species.